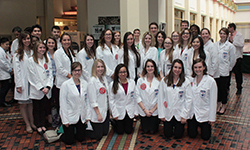 More than 40 student pharmacists, residents, and faculty from Duquesne University Mylan School of Pharmacy traveled to the State Capitol in Harrisburg, PA on Wednesday, April 6, 2016 to attend the Annual Pharmacy Legislative Day. Students met with state representatives and senators to discuss pending legislation relative to healthcare and pharmacy practice. Joined by pharmacists and student pharmacists from across the state, attendees pushed for fair pharmacy audit practices, registration and transparency for pharmacy benefit managers (PBMs), and the substitution of interchangeable biologic products without cumbersome notification requirements. Brittany Carney, from the Pharmacy Class of 2018 commented, "Legislative Day was an excellent experience that allowed us to advocate for the profession of pharmacy. So many pharmacists and student pharmacists were at the capital to speak to legislators about important bills that will have a huge impact on how we are able to continue to serve patients in the practice of pharmacy." In addition to advocacy efforts, students had the opportunity to demonstrate the types of patient care services that pharmacists can provide by offering carbon monoxide screenings and tobacco cessation information.